The Bible declares that when Lazarus died, he “was carried away by the angels to Abraham’s bosom…” (v. 22). Being in Abraham’s bosom symbolizes being where Abraham is in Paradise, a place of great bliss where righteous souls are temporarily taken to at death to await the final judgment. Being spiritually affiliated with Abraham connotes blessings. For “…those who are of faith…are sons of Abraham” (Gal. 3:7) and “are blessed with Abraham, the believer” (v. 9). And, surely, with the exception of the Sadducees, Jews would have no trouble in believing that Abraham was in Paradise — and not only in Paradise, but also, according to Siegfried Goebel, that to the Israelite, Abraham would seem to be “the personal centre and meeting-point of Paradise.” Goebel also writes, “‘To be in Abraham’s bosom’ is a designation, common elsewhere in Jewish theology, for the fellowship of dead believers with Abraham in Paradise. …Hence this hope is to be gathered to Abraham, and to be permitted, in fellowship with him, to enjoy paradisaic bliss” (The Parables of Jesus: A Methodical Exposition, p. 239). 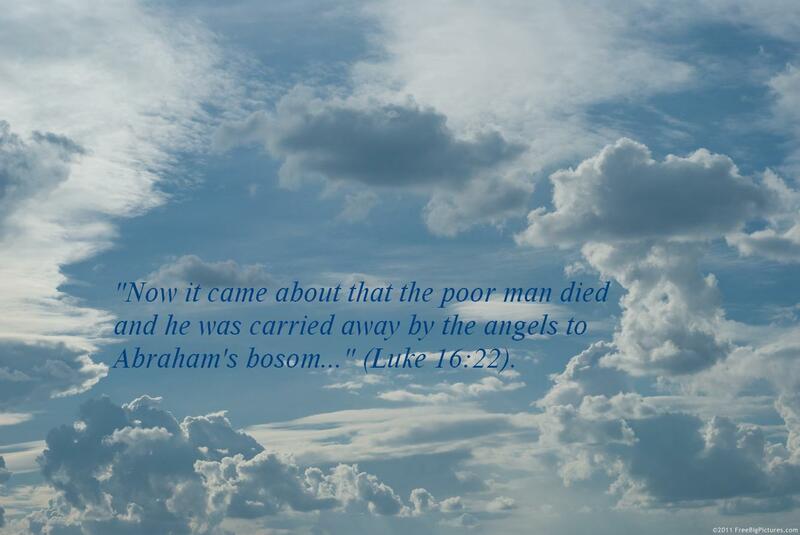 It can also be pointed out that the idea of being “in Abraham’s bosom” is based on a practice that was common at that time in which people would recline on their sides to eat and rest their head on the bosom of another. For instance, “There was reclining on Jesus’ bosom one of His disciples, whom Jesus loved. So Simon Peter gestured to him, and said to him, ‘Tell us who it is of whom He is speaking.’ He, leaning back thus on Jesus’ bosom, said to Him, ‘Lord, who is it? '” (Jn. 13:23-25). Paul also speaks of this time “…when the Lord Jesus shall be revealed from heaven with His mighty angels in flaming fire, dealing out retribution to those who do not know God and to those who do not obey the gospel of our Lord Jesus. And these will pay the penalty of eternal destruction, away from the presence of the Lord and from the glory of His power, when He comes to be glorified in His saints on that day, and to be marveled at among all who have believed…” (2 Thess. 1:7-10). What the angels will do with the lost is certainly quite a contrast to what they will do for the redeemed. Let us, therefore, submit our lives (by our faith and obedience) to Jesus Christ; so that when the angels come for us, we will also be carried to that beautiful place of bliss where Abraham is and all the departed saints! For that is truly what God wants for everyone — but we must be willing to meet His terms and do so, if we want heaven to be our eternal home (cf. 2 Pet. 3:9; 1 Tim. 2:4; Rom. 10:17; Jn. 8:24; Acts 17:30; Rom. 10:9,10; Mark 16:16; Rev. 2:10). During his second Roman imprisonment, and shortly before his execution, the apostle Paul wrote his last epistle in the New Testament to Timothy, sometime between A.D. 66 to 68. We often use that idea of “departure” today in referring to someone who has “departed” from this earth-life. In one of last week’s articles, on “The Outer and Inner Man,” a boat in ruin was used to figuratively represent the case of some people today who would become physically disabled or limited to what they once were able to do. But there is also another way in which a ship in good shape can be used metaphorically in pertaining to one’s death. 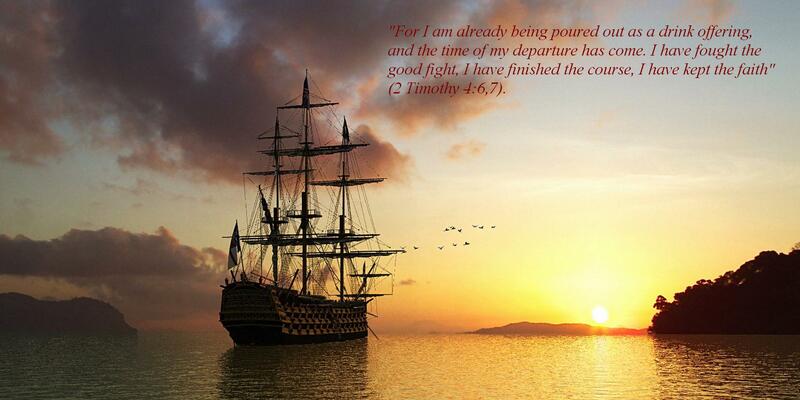 For the Greek word (analusis) that is rendered as “departure” in 2 Timothy 4:6 has as its third meaning, “departure…a metaphor drawn from loosing from moorings preparatory to setting sail” (Thayer’s Greek Definitions). That makes for a beautiful picture for those who will be making their voyage to Paradise, where Jesus had also gone with the penitent thief on the cross (Luke 23:43). Though it is sad to see our loved ones departing on that voyage, yet we know that they are truly going to a better shore when they are God’s children. And what should also bring comfort to our hearts is in knowing that if we also submit our lives to the Lord Jesus Christ and live for Him, that we, too, will one day be able to make that blissful passage to join them in that much “…better country, that is, a heavenly one” (Heb. 11:16), where God “…will wipe away every tear from their eyes, and there will no longer be any death; there will no longer be any mourning, or crying, or pain…” (Rev. 21:4). There will also not be any sickness, any poverty, any bellies aching to be fed, any prejudice, any injustice, any of the terribly ugly and inhumane acts that people have often committed during this earth-life. No hate, no murders, no theft, no crimes of any kind, no liars, no vulgarity, no immorality, and nothing else to mar the beauty and perfection of that amazing life beyond. Simply put, heaven is a place where sin does not exist; but where the glory, goodness, and blessings of God eternally abound! How wonderful heaven must be! In view of what the Lord has in store for His faithful followers, the apostle Paul declares, “For to me, to live is Christ and to die is gain. But if I am to live on in the flesh, this will mean fruitful labor for me; and I do not know which to choose. But I am hard-pressed from both directions, having the desire to depart and be with Christ, for that is very much better; yet to remain on in the flesh is more necessary for your sake. Convinced of this, I know that I will remain and continue with you all for your progress and joy in the faith” (Philippians 1:21-25, emphasis mine). A ship at my side spreads her white sails to the morning breeze and starts for the blue ocean. She is an object of beauty and strength, and I stand and watch until at last she hangs like a speck of white cloud just where the sea and sky come down to mingle with each other. Gone where? Gone from my sight . . . that is all. May we all be ready for that time when our departure will come. For if we are, what a great eternity we will enjoy! “…the Lord God formed man of dust from the ground, and breathed into his nostrils the breath of life; and man became a living being” (Gen. 2:7). After the sin of Adam and Eve, God told Adam, “By the sweat of your face you shall eat bread, till you return to the ground, because from it you were taken; for dust you are, and to dust you shall return” (Gen. 3:19). However, the Lord also shows that man is more than just his temporary “tabernacle” of flesh that returns to the dust. For man was created in the image of God (Gen. 1:26,27), and that does not pertain to the fleshly part of man — for God is Spirit (Jn. 4:24). So it is the spirit or soul in man, that entity that never ceases to exist, that was made in God’s image. Therefore, when death comes, “the dust will return to the earth as it was, and the spirit will return to God who gave it” (Eccl. 12:7). A picture I used to illustrate this passage on facebook is of a small, dilapidated boat, buried about a foot in the sand by the sea. As we grow older, we might imagine ourselves, at times, as being somewhat like that broken-down boat if we would ever become hindered from being able to do all the things we once did. But in this picture is also a beautiful sunset warmly filling the sky and evoking the thought that, despite our physical limitations, we can often still have an inner peace, a joy, and a delight in the beautiful things of God and in His word with which we as Christians have been growing and maturing, over the years, in our inner man — and have, thus, been making our souls joyfully ready to meet our Maker. Yes, there can be beauty and benefit in even some forms of brokenness. The psalmist, for instance, could view even affliction in a positive light because it helped bring him into a right relationship with God. As the psalmist says, “Before I was afflicted I went astray, But now I keep Thy word” (Psa. 119:67). “It is good for me that I was afflicted, That I may learn Thy statutes” (v. 71). “I know, O LORD, that Thy judgments are righteous, And that in faithfulness Thou has afflicted me” (v. 75). Paul certainly learned that lesson, too: As he declares, “And because of the surpassing greatness of the revelations, for this reason, to keep me from exalting myself, there was given me a thorn in the flesh, a messenger of Satan to buffet me — to keep me from exalting myself! Concerning this I entreated the Lord three times that it might depart from me. And He has said to me, ‘My grace is sufficient for you, for power is perfected in weakness.’ Most gladly, therefore, I will rather boast about my weaknesses, that the power of Christ may dwell in me. Therefore I am well content with weaknesses, with insults, with distresses, with persecutions, with difficulties, for Christ’s sake; for when I am weak, then I am strong” (2 Cor. 12:7-10). Though much speculation has been made over what Paul’s “thorn in the flesh” actually was, yet regardless, it was something annoying and which he initially desired and fervently prayed to have removed, prior to his learning from the Lord of the benefit in its remaining. Had it not been for his faith in God and commitment to Him, which characterized Job’s inner man, would he have become that great example for the world when it comes to patiently enduring adversity and great suffering? Despite all he went through, Job kept his trust in the Lord and declared, “And as for me, I know that my Redeemer lives, And at the last He will take His stand on the earth. Even after my skin is destroyed, Yet from my flesh I shall see God; Whom I myself shall behold, And whom my eyes shall see and not another…” (Job 19:25-27). As we also head toward that destination to see God, the outer man can sometimes make that journey difficult; but, at the same time, also give more incentive toward that goal. For Paul goes on to say that “…momentary, light affliction is producing for us an eternal weight of glory far beyond all comparison, while we look not at the things which are seen but at the things which are not seen; for the things which are seen are temporal, but the things which are not seen are eternal. For we know that if the earthly tent which is our house is torn down, we have a building from God, a house not made with hands, eternal in the heavens. For indeed in this house we groan, longing to be clothed with our dwelling from heaven; inasmuch as we, having put it on, shall not be found naked. 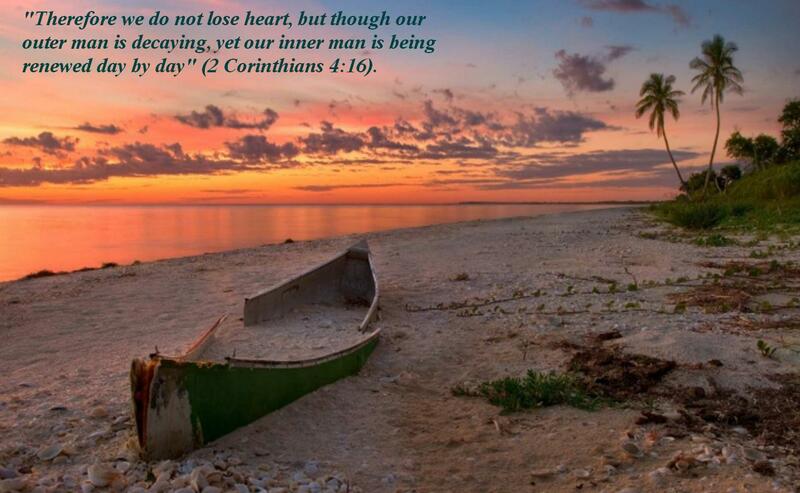 For indeed while we are in this tent, we groan, being burdened, because we do not want to be unclothed, but to be clothed, in order that what is mortal may be swallowed up by life” (2 Cor. 5:17-6:4). Though our outer man perishes, that is all right. For our physical body is not the body that would be able to eternally dwell in heaven anyway. There must, therefore, be that great change first, which Paul writes of to Christians in 1 Corinthians 15: “And just as we have borne the image of the earthy, we shall also bear the image of the heavenly. Now I say this, brethren, that flesh and blood cannot inherit the kingdom of God; nor does the perishable inherit the imperishable. Behold, I tell you a mystery; we shall not all sleep, but we shall all be changed, in a moment, in the twinkling of an eye, at the last trumpet; for the trumpet will sound, and the dead will be raised imperishable, and we shall be changed. For this perishable must put on the imperishable, and this mortal must put on immortality, then will come about the saying that is written, ‘DEATH IS SWALLOWED UP in victory. O DEATH, WHERE IS YOUR VICTORY? O DEATH, WHERE IS YOUR STING?’ The sting of death is sin, and the power of sin is the law; but thanks be to God, who gives us the victory through our Lord Jesus Christ” (vv. 49-57). Though Paul’s outer man experienced much sufferings in this earth-life — whether in the many imprisonments, “beaten times without number…,” in receiving 195 lashes from the Jews, in being beaten 3 times with rods, and even stoned once (2 Cor. 11:23-25) — yet, in his inner man, he could draw strength from the Lord. Paul writes: “For this reason I also suffer these things, but I am not ashamed; for I know whom I have believed and I am convinced that He is able to guard what I have entrusted to Him until that day” (2 Tim. 1:12). It was soon after being struck many times with rods and cast into the inner prison, where their feet were fastened in stocks, that Paul and Silas spent the late night “praying and singing hymns of praise to God” (Acts 16:22-25). What a contrast between the two states of the outer and inner man! We need to also put our focus on spiritual things, to keep God first in our lives, to faithfully strive to carry out His will for us; and, as we do so, we will then be building up our inner man and continuing to develop even more into the likeness of Christ. In speaking of his labor among the Galatians, Paul saw a need for it “until Christ is formed in you” (Gal. 4:19). Paul, therefore, not only taught others to help bring about that goal, but he also prayed toward that as well. As he mentions to the Ephesians: “For this reason, I bow my knees before the Father, from whom every family in heaven and on earth derives its name, that He would grant you, according to the riches of His glory, to be strengthened with power through His spirit in the inner man; so that Christ may dwell in your hearts through faith; and that you, being rooted and grounded in love, may be able to comprehend with all the saints what is the breadth and length and height and depth, and to know the love of Christ which surpasses knowledge, that you may be filled up to all the fulness of God” (Eph. 3:14-19). It is God’s desire that His people “become conformed to the image of His Son” (Rom. 8:29). To strive to attain to that, this chapter also emphasizes the need for the mind to be set on things of the Spirit, rather than merely things of the flesh. For it is those things of the Spirit by which our inner man can mature in godliness. To help us realize the value of the inner man, Jesus put it this way in Mark 8:36: “For what does it profit a man to gain the whole world, and forfeit his soul?” Even if you could gain it all, would it be worth losing your soul over? The rich, productive farmer who had such a good harvest that he needed to tear down his barns in order to build larger ones for storage, certainly had plenty for the outer man to live on for many years. So he now thought he could just take his ease — “eat, drink, and be merry” — but he did not know that that night was to be his very last! And what had he done for the inner man to be ready to meet the Lord? Apparently, nothing. God, therefore, called that man a “fool” for being unprepared (Luke 12:16-21). His focus appears to have only been out of a concern for his outer man rather than his inner man. But the Lord goes on to show that even the necessities of life should not be our top priority! Rather, our chief concern should always be to “seek first His kingdom and His righteousness” (Matt. 6:33). For striving to put God’s word first in our lives, and living according to it, is also the way of renewal for our inner man and how we maintain our relationship with God (cf. 2 Pet. 3:18; 1 Pet. 2:2; Acts 20:32). May we, therefore, never neglect that — but always continue on that path to eternal glory! I appreciate Luke Lively granting me permission to use this interesting picture he captured. It well illustrates the Bible verse on it. For all of nature is just temporary, but its very existence attests to the need for a great First Cause to have made it all possible. 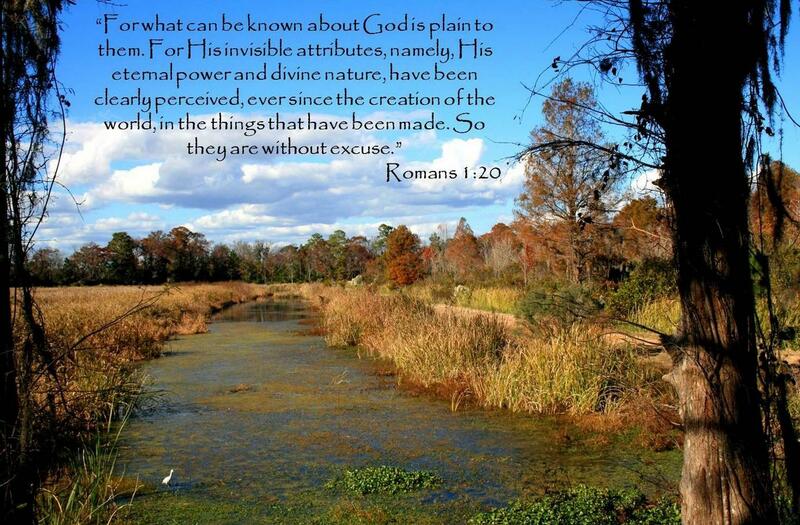 And that First Cause had to always be (or else it would have never been), which is one of the inferences Paul shows in Romans 1:20 that we can make from the creation itself: that God is eternal. In addition, what has been made also implies the need for great intelligence to have designed all the vast varieties of living things — from the simple to the highly complex. Just think of all there is to consider in our own anatomy! Our body consists of so many different needful components. We not only have all of the right parts, but we also have them in all of the right and best places. For instance, where is a better place to have your hands than right there where you have them? Or to have your feet at the bottom of your legs, while your eyes are way up high to better see, as if from a tower? How far different the eye is from the ear, or the heart from the brain, or the lungs from the kidneys, etc. Yet they each are very needful and have their own special function. How could these, and the numerous other components that make up our bodies, come about by mere chance or coincidence? How could so much complexity and vital integration of parts simply evolve from a non-thinking substance? How did the genetic code come about, the information in our DNA, that helps form the way we are — and also does so for every living creature, and giving each one exactly what is needed, regardless of how vastly different one creature is from another? Just as computer software required a programmer, who or what programmed the DNA to be able to encode the right genetic instructions for the intelligent development of all known living organisms? Did it not also have need of a Programmer, a Designer? Not one man-made thing — whether great or small — ever came about without man’s ingenuity and involvement. But are we to make an exception to that principle when it comes to our entire universe and every non-man-made thing therein? That it required no “inventor,” no “designer,” and no “builder” or “producer”? As Paul points out, God’s “eternal power and divine nature” have “been clearly seen…through what has been made, so that they are without excuse” (Rom. 1:20). All of nature is a reminder of God. As David writes, “The heavens are telling of the glory of God; And their expanse is declaring the work of His hands” (Psa. 19:1). The child of God knows who to thank for the wonders and beauties of creation. And by looking into His word we have the additional source that reveals even more about the Lord and those needful instructions pertaining to salvation. Let us, therefore, not neglect to examine that message. For it is “the power of God for salvation” (Rom. 1:16) and the words of eternal life (Jn. 6:68). Especially when bombarded with the continual news-reports of such terrible things happening in our world today, or of whatever the troubles, sorrows, and even tragedies that might come the Christian’s way, the true child of God need not worry nor fret. For “God is our refuge and strength, A very present help in trouble” (Psa. 46:1). What a beautiful and encouraging truth. In the Lord, the Christian has shelter, protection, and comfort from the dangers and tribulations of life. For God’s care and benefits for His people are not just for the great by-and-by in heaven itself; but also for the here and now, at this very moment. Yes, God is “a very present help in trouble” (emphasis mine). This, of course, is not to say that the child of God is exempt from all the adversities, struggles, and trials of this earth-life; but it is to say that he does have a loving Father in heaven to help see him through all of those difficult and trying times (cf. 1 Cor. 10:13; 1 Pet. 5:6,7). As the psalmist goes on to say, “Therefore we will not fear, though the earth should change and though the mountains slip into the heart of the sea; Though its waters roar and foam, Though the mountains quake at its swelling pride” (vv. 2,3). The psalmist could have this confidence and consolation because, regardless of what the day would bring, “The LORD of hosts is with us; The God of Jacob is our stronghold…” (v. 7) — and even when the “nations [the heathen who were not God’s people] made an uproar” and “the kingdoms tottered” (v. 6). For what challenge are they to God, as His enemy, when He has the power to melt the earth and bring desolation with merely a word? 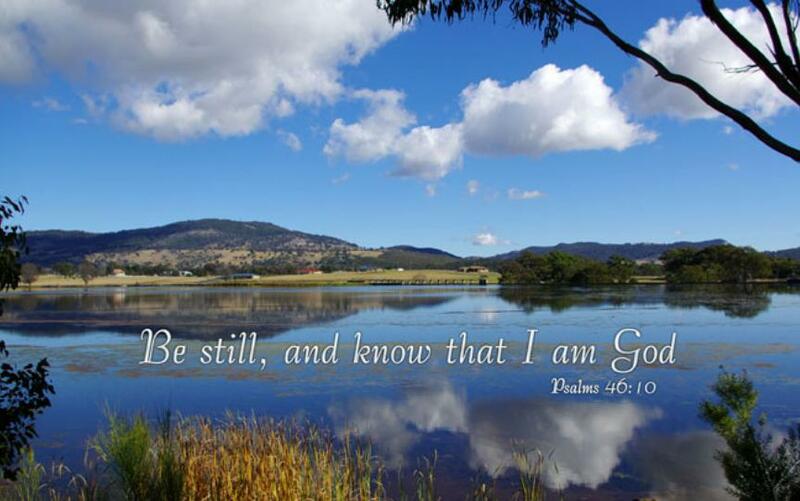 So in view of God’s superiority over all the enemies of His people, and in view of the Lord’s great compassion for His own and His desire to aid them through whatever their hard times, He declares, “Be still, and know that I am God” (v. 10, emphasis mine). The Hebrew word for “Be still” (raphah) has various meanings: “…to let drop, abandon, relax, refrain… to let go… to be quiet” (Brown-Driver-Briggs’ Hebrew Definitions). It conveys the idea in this verse to not be worried, distressed, or disturbed — to not be troubled. The NASB translates it as “Cease striving”; but it is also rendered as “Desist” (Young’s Literal Translation), “Let go of your concerns!” (God’s Word), and “Be at peace in the knowledge that I am God” (Bible in Basic English). How special God’s people are to Him. They are, as this verse shows, “the apple of His eye”; or, in other words, “what is most dear to him” (Bible in Basic English). The psalmist then repeats and closes with those comforting words that “The Lord of hosts is with us; The God of Jacob is our stronghold” (Psa. 41:11). What a wonderful thing for the Christian to remind himself of, to be humbly thankful for, and to draw strength from: God is with us as we remain with Him. The more we increase in faith through the Scriptures (cf. Rom. 10:17), the more we will be able to “Be still” and truly know God — and not with merely a head filled with Bible facts, but also with a heart increasing in more love and devotion for Him who first loved us, and enabling us to have a closer walk in our spiritual relationship with our Lord. So let us continue to feed ourselves upon God’s word that our faith in Him will continue to grow; and we will be able to better do, as He had commanded those of ages past, and especially when we have many burdens weighing us down, to “Be still, and know that I am God” (Psa. 46:10. Emphasis mine).